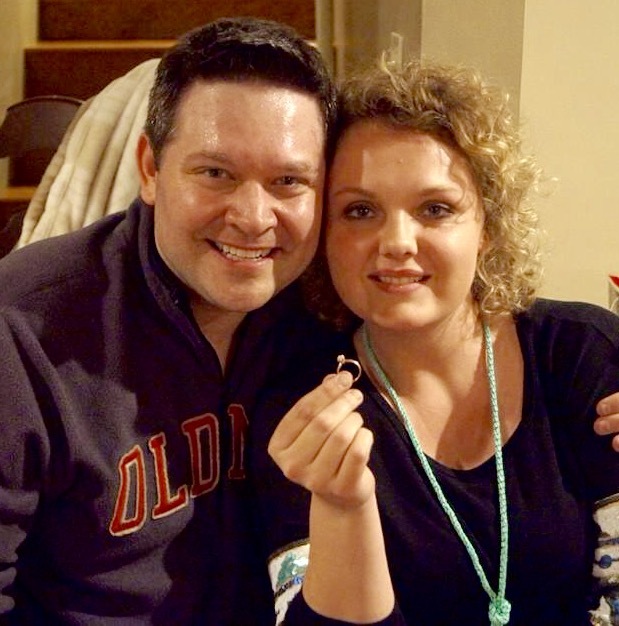 Congratulations Kasey and Haley Kemp…. Our little Avaline entered the world on 10/11/16 at 7:54pm. 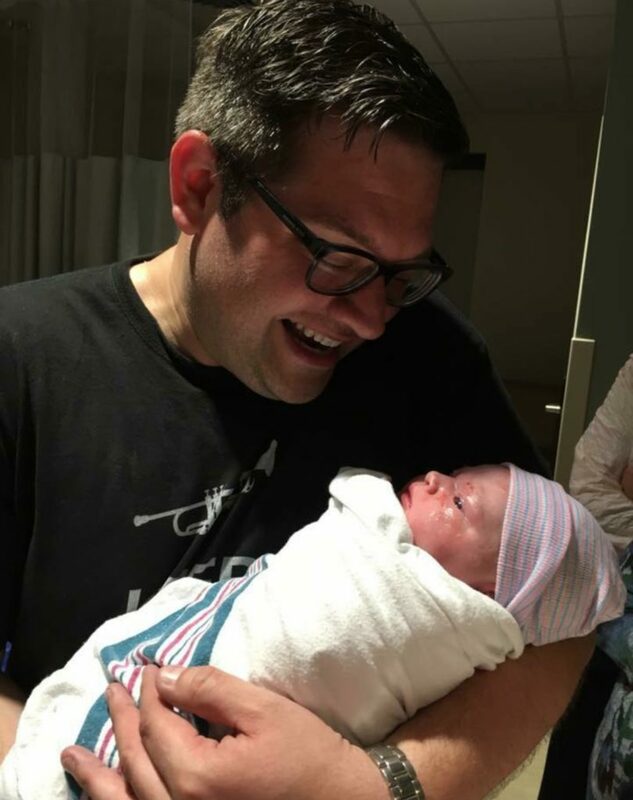 She weighed in at 8 pounds 7 ounces and is 19 inches long. Here are a few pics. More to come! Both baby and Mom are doing great. Thank you for your prayers. Posted in announcements | Comments Off on Congratulations Kasey and Haley Kemp…. ALLEGIANCE GOSPEL GROUP FRIDAY, SEPTEMBER 23rd. at 7:00 PM. Gospel Concert will be at Central Baptist Church 116 West MT. Vernon ST. in Mabank, TX. “Allegiance Singing Group” is from Goodlettsville, Tennessee. Allegiance traveled with the well known Booth Brothers for two years. Their newest song release “I Will Stand” was selected to be in a leading movie. These young men love the Lord and it shows in there singing. 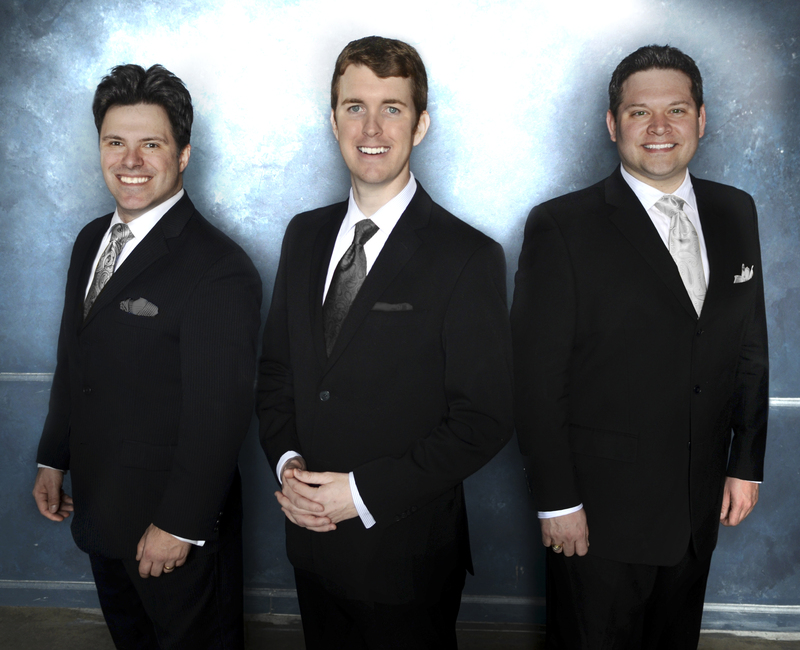 They will be singing at the National Quartet Convention in a couple of weeks. New Grace Promotions invites you to join us for this special concert! NO ADMISSION! We will be taking a love offering to meet their needs. Their product table will be available for purchase of their CD’s, DVD’S, & other products. 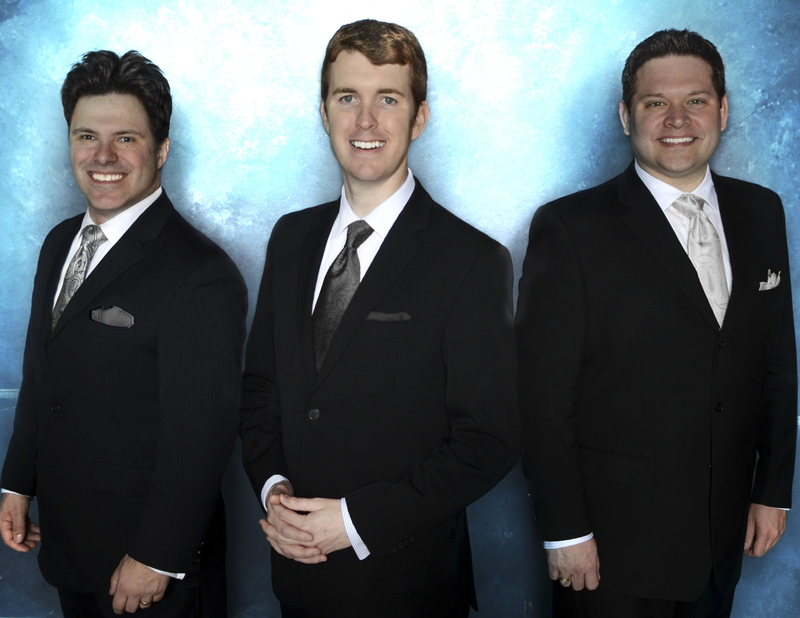 What better way to spend the evening than listening to great Southern Gospel Music! 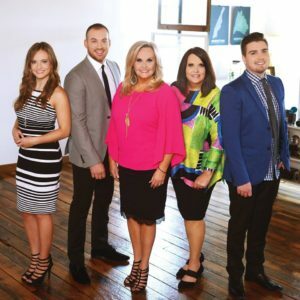 Let your friends know that love Southern Gospel Music! 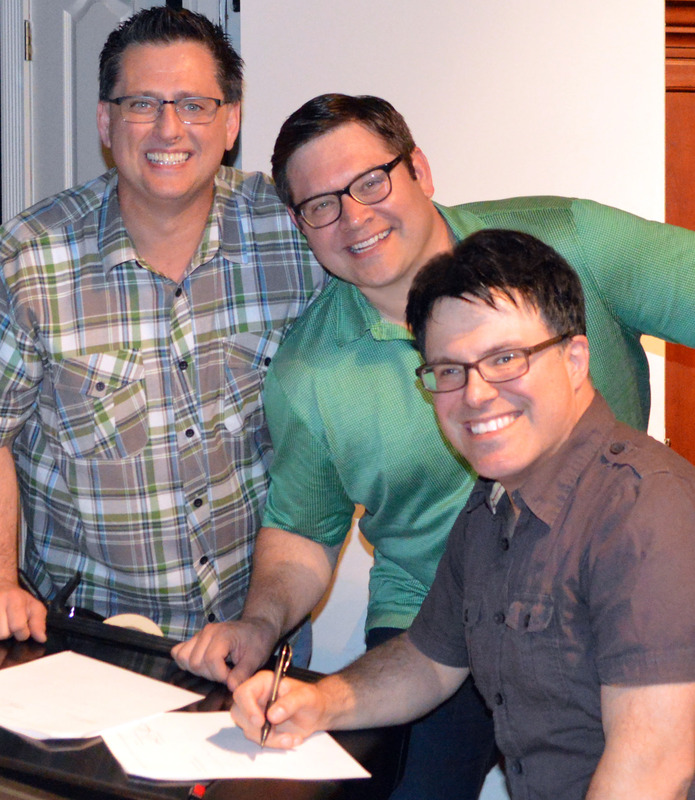 Song Garden Music Group is thrilled to announce the signing of “Allegiance” to the Garden! The group has been nominated in the “Top 10 New Trios” four years in a row by the readers of the Singing News Magazine. 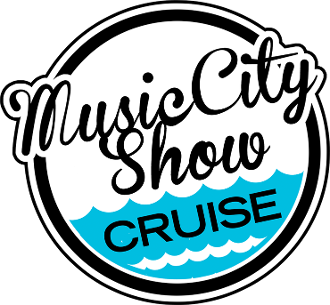 They have had multiple “Top 80” charting songs and keep a schedule of over 180 dates per year. They are known for their harmony, humor, and heart. Their new project, “Time to Sing” has been over a year in the making. 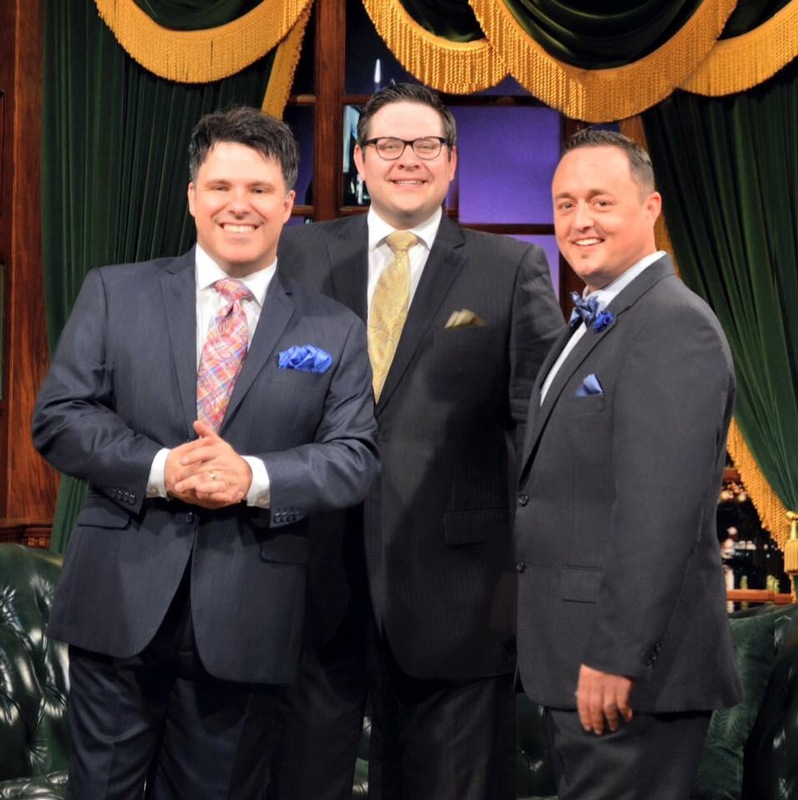 It is produced by Nick Bruno and Wayne Haun and features the groups new tenor Heath Pannell. It also features the popular patriotic song “I Will Stand”. Jake Sammons and Kasey Kemp of Allegiance had this to say about entering “The Garden”! Jake and I are absolutely thrilled that Allegiance is now part of the Song Garden Music family. We have been planning this record for over a year, carefully writing and picking material that fits what we wanted to say spiritually and musically. Being “in the garden” has allowed us to make this record a reality and share it with the world. We appreciate our friends the Keffers and Gus Gaches for believing in our vision and calling. 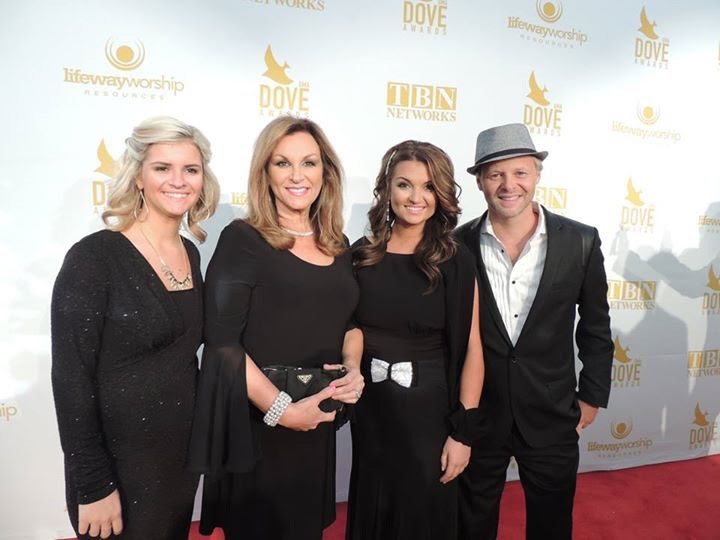 We feel we are blessed to work with some of the greatest people in the gospel music community. 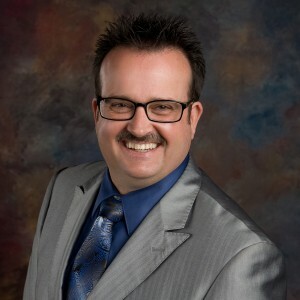 Gus Gaches, Director of Song Garden Music Group states, “We are thrilled to have Allegiance joining us. These guys are hard workers, and it shows with their new project. They have really matured musically, and we are thrilled that they have decided to join “The Garden”. We look forward to all of the “sowing and reaping ” we will do together in years to come! Following the recent release of their Patriotic song, I Will Stand, popular trio Allegiance is proud to announce the I Will Stand Tour. 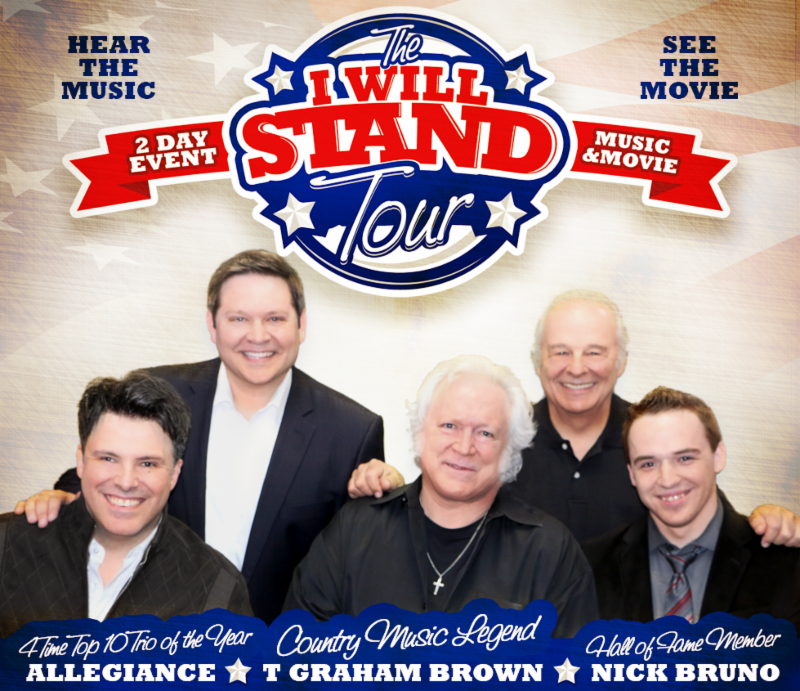 This special tour finds them teaming up with SGMA Hall of Fame member, Nick Bruno, Country Music Legend, T Graham Brown, Patriotic organization Helping a Hero and Ben Graham Productions of the I Will Stand film. On most occasions, this tour will be a two day event featuring a concert on the first day and showing of the I Will Stand film the second. Proceeds will benefit Helping a Hero to build specialty homes for wounded Veterans. Regarding the tour, Kasey Kemp of Allegiance comments , “After Jake wrote the song, we began seeking opportunities to honor our American heroes with the music and beyond. We were blessed to meet Helping a Hero through Lee Greenwood (singer/songwriter of God Bless the USA) and connect with their mission. At the same time, God allowed our paths to cross with T Graham Brown who shares our vision to honor American heroes. Adding to the mix our producer, music legend Nick Bruno, and the blessing of being in the I Will Stand film, this tour began to take shape. Feel free to share with your friends and most of all PRAY for our Country. 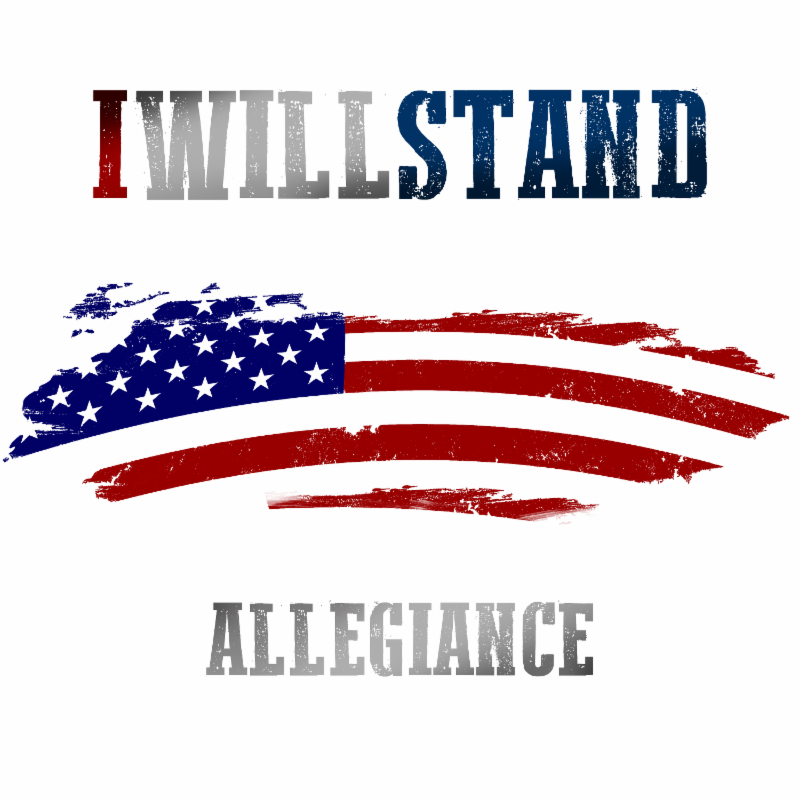 Posted in announcements | Comments Off on #iwillstand, Will YOU? SGN Scoops is pleased to present these postings which focus on prayer, for the National Day of Prayer. We hope they draw you nearer to the Almighty, the focus of our prayers. Not to sound like a broken record, but PRAYER truly is the key to heaven. 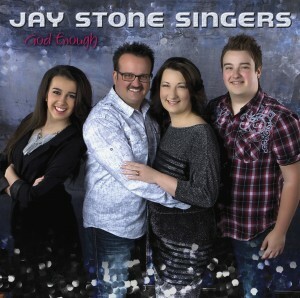 So many times in my personal life and in the ministry of Jay Stone Singers have we seen God move and answer prayer! When we are out on the road, I usually do most of the bus driving and one of my favorite times is early morning hours driving down an Interstate! God still answers prayers and I know He heard my prayer! When I was growing up, we had a family bible on our family coffee table. The table was built by my grandpa and was the place I knelt to pray, at the age of seven, when my Dad led me to Jesus to Christ. Now, years later, I still have that little table and it is still a very special place for me to pray. I thank God for the gift of prayer knowing God does hear and answer what He knows is best for us. 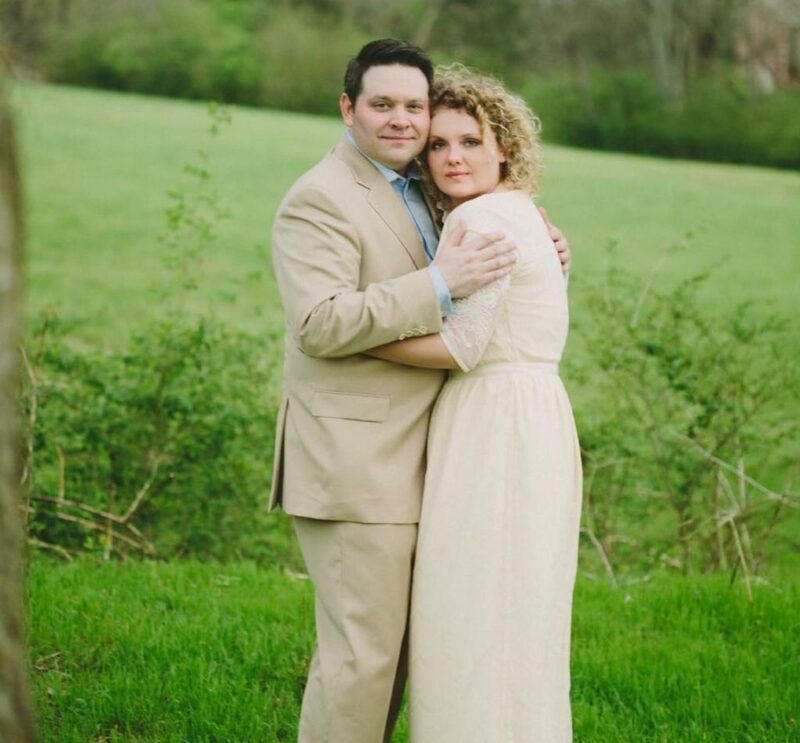 Recently, a huge prayer request was answered when God sent me my beautiful wife Haley. I prayed for many years and on April 7 (my birthday) of this year we said “I DO!” God answered prayer by blessing me with a Godly, beautiful wife. I praise God for answered prayer each week as Allegiance travels. God continues to keep us and our families safe and allows us to see people saved and encouraged. Prayer truly is an amazing gift from God. February 20, 2015 will be a special night in the Detroit, MI metro area. 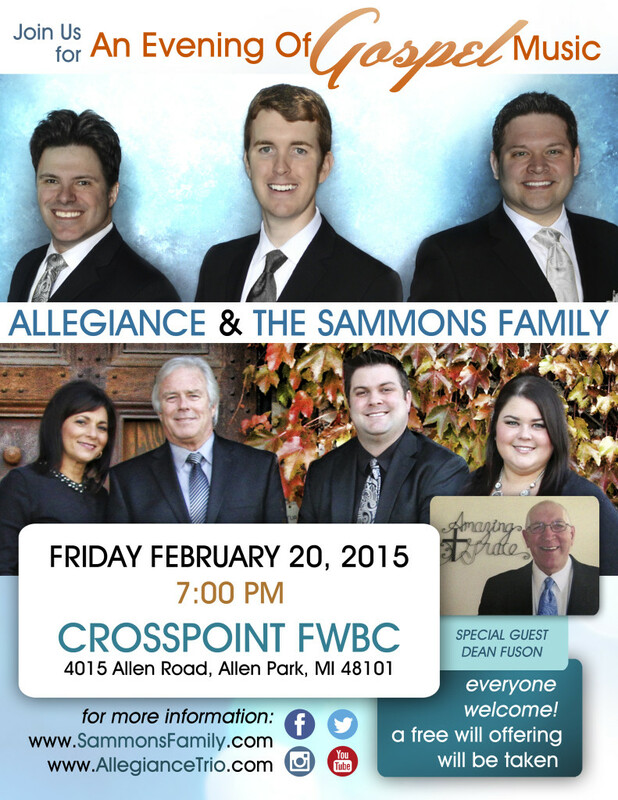 Allegiance and The Sammons Family, (relatives of Allegiance baritone Jake Sammons) will be in concert together at the Crosspoint Free Will Baptiat Church, Allen Park, MI. Also, during the second half, Allegiance will be joined by 16 year old bass vocalist Cameron Jones of Monroe, MI. Cameron is a friend to the group an a bright, young talent. Join them for an exciting evening of gospel music, fellowship and worship. Christmas was special for Kasey Kemp of Allegiance and Haley Young of the Angela Lilly Trio this year. The happy couple became engaged after nearly two years of dating. 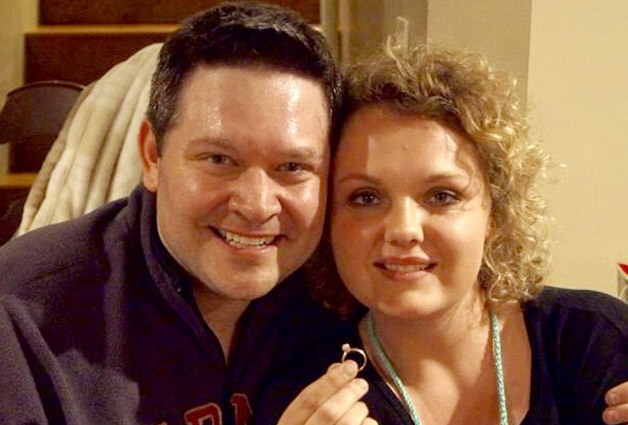 A small wedding is being planned and the couple plans to reside in the Nashville, TN area, home to Allegiance.